I created a new document by using API, and created Smart search index with type = pages to get indexes of document. I tried to use 2 ways for inserting document to Kentico tree. 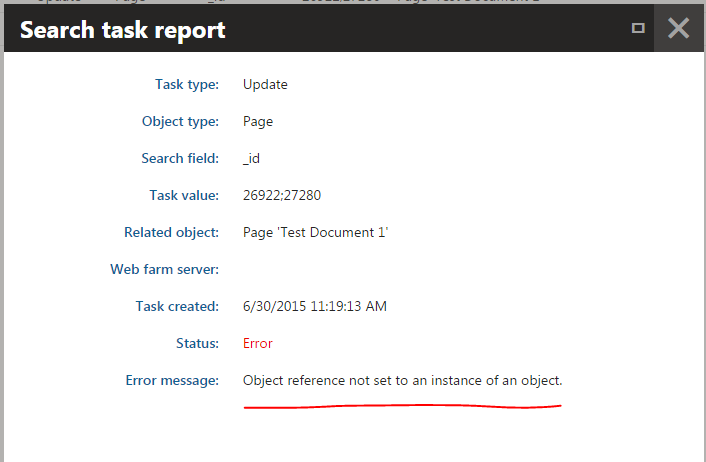 This node inserted to Kentico tree successful, but Indexed items number of Smart search didn't update. Did I do anything wrong, or I need to code something to make the Smart search index work for this case. Method 2 - newNode.Insert(parentNode) is working fine on my end. Could you please tell me what version of Kentico are you using? Have you applied any hotfixes? Also if you create a new document via user interface rather then using API, does it work properly? I'm using the latest version of Kentico - 8.2, and applied the latest hotfix - 8.2.26. It works properly when I create a new document via user interface. I was in touch with development team and found out that you are supposed to use InsertDocument method. If you use this method Staging and search indexing tasks should be generated automatically. At this point we need to know if the search tasks is created or not. Could you please check it in Smart search application -> Tasks tab? Is the task created when you use the InsertDocument method? I'm using InsertDocument method. Tasks are created when I created a new document. But the result of it is Fail. I took 2 pics for this problem below. I am not able to reproduce the issue on my end. Could you please provide a background? Where are you trying to call InsertDocument method? For example is that your custom web part? Could you please provide the code? If you do not want to share the code on Q&A, feel free to send an email to support@kentico.com and in the subject put "attention Roman". I have just sent an email to support@kentico.com. Could you help me to check it?